Home › 4. Oil & Gas / Utilities › Water & Fracking: Will Real-Time Monitoring Help? 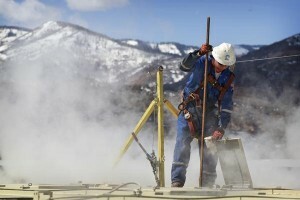 Water & Fracking: Will Real-Time Monitoring Help? In a recent article in the Denver Post it was reported that the state of Colorado is launching a new system for real-time water quality monitoring in the state’s oil and gas regions. According to the story, this system will allow state regulators, oil-gas operators and the public to check water quality at monitored wells around the clock. As an occasional follower of the controversies surrounding fracking operations, I am quite interested to see what this tool will be able to offer. I am also very curious whether it will be something that can be adopted in other water-stressed regions where fracking operations and the public are colliding. Colorado is not the only water-stressed region that needs to address the issues around fracking near water sources. In an article in National Geographic, the author quoted a study by the World Resources Institute (WRI) that 38% of global shale gas sites are located in regions of water stress. According to Ceres, nearly half of US fracking wells in operation since 2011 are located in regions with high or extremely high water stress. With these kinds of statistics, I would guess that a tool that provides real-time monitoring will have a huge benefit to many. As an M2M professional, I am looking forward to seeing how machine-to-machine technology will be able to support water monitoring initiatives for fracking operations. Given the volume of water and the assortment of chemicals possibly present in the fracking fluid, it will be fascinating to see what the complete solutions will look like and how frequently data will be updated. I would suspect that more frequent (and accurately calibrated) monitoring in what is needed to increase public confidence. What are your thoughts? Do you think online water monitoring will help deal with some of the controversies surrounding fracking?